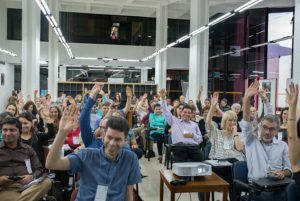 On 15 November 2018, members of the Chagas Clinical Research Platform and the Global Chagas Coalition, participating in the VIII Meeting of the Chagas Platform in Santa Cruz de la Sierra, Bolivia, signed this letter addressed to governments, organizations and donors requesting an intensification in the efforts to control and eliminate Chagas disease as a public health problem. In the last 10 years, there have been significant efforts in the fight against the disease. However, many challenges remain. Next 2019 marks the 110th anniversary since the discovery of the disease and constitutes an opportunity to call attention to people affected by the disease and pursue necessary actions. It is estimated that Chagas disease, or American trypanosomiasis, affects more than 6 million people worldwide, with approximately 30,000 new cases each year, mainly in the Americas. However, less than 10% of people with Chagas disease in the Americas have been diagnosed and very few receive the treatment they need. Mother-to-child transmission is one of the main ways the disease continues to spread, with approximately 9,000 infants born every year with the infection. If not detected and treated on time, Chagas may cause irreversible, life-threatening damage to the heart and other vital organs. Currently, there are only two drugs available to treat Chagas disease – nifurtimox and benznidazole – both discovered half a century ago, underscoring the persistent lack of investment in research and development (R&D). These drugs can and should be improved. Controlling and eliminating Chagas and other neglected tropical diseases (NTDs) as public health problems is essential in order to achieve the United Nations Sustainable Development Goals (SDGs), especially SDG 3, which covers health and wellbeing and includes Universal Health Coverage. SDG 3 also calls on countries to support and contribute to the research and development of new vaccines and drugs for communicable and noncommunicable diseases that mainly affect developing countries. During the Ibero-American Conference of Ministers of Health in Cartagena, Colombia in 2016, the ministers committed to supporting the implementation of sustainable intervention models for the prevention and control of vector-borne diseases, including Chagas disease. Recently, the global health community has also renewed commitments to tackle NTDs. In the Mar del Plata Declaration in 2018, the G20 health ministers supported strengthening health systems to improve access to health care and achieve Universal Health Coverage, recognizing stronger health systems are needed to combat infectious diseases, including neglected tropical diseases. The Chagas Platform and the Chagas Global Coalition share a commitment to fostering innovation and R&D, focusing on patients’ needs, and providing evidence to guide public health policies and clinical practices. In order to find scientific answers that enable the creation of new and better tools that respond to the needs of people living with Chagas; the Chagas scientific community is committed to increasing collaboration and synergy, partnering with civil society, and organizing consortia to advance research whenever possible. Expand access to diagnosis and treatment of the disease within the framework of health systems. This should include measures to reduce congenital transmission, such as systematic screening of pregnant women and babies, and improve access to diagnosis and treatment for women of reproductive age, with the active participation of affected communities. National guidelines should also ensure that diagnosis and treatment based on the most recent clinical evidence is available in primary healthcare facilities in or near affected communities, integrated into a well-defined referral system. Increase investment in research and development, in alignment with the SDGs, to obtain new, safer and more effective therapeutic tools. This includes undertaking research to optimize the current treatment, identifying and evaluating new chemical entities (NEQs) to be used in monotherapy or in combination; creating formulations adapted to newborns and children with adequate pharmacokinetic studies that allow adjusting dosage in an appropriate way; advancing new preventive or therapeutic vaccines to complement these strategies; generating better diagnostic tests; developing biomarkers to more accurately assess cure after treatment as well as predict disease progression; and designing and implementing a multi-country, multi-site, collaborative, long-term cohort to validate these biomarkers, and thus contribute to informing and guiding research priorities. Improve the surveillance of Chagas disease by establishing compulsory reporting of chronic cases and their complications in the general population. This will allow for the real burden and distribution of the disease to be known so that appropriate public health strategies can be mounted. Finally, to help reverse the silence and negligence that has marked Chagas disease since its discovery in 1909, the undersigned members of the Chagas Research Platform and Chagas Global Coalition support the request of the International Federation of Associations of People Affected by Chagas Disease (FINDECHAGAS) for the official establishment of the International Day of People Affected by Chagas Disease on April 14. On this day, every year, governments, organizations, donors, patients and all those who are involved in the fight against Chagas should unite their efforts in raising awareness of the disease and commemorating those individuals and families who have suffered in silence. The Chagas Clinical Research Platform was created in 2009 and today has 400 members from 150 institutions and 24 countries worldwide. It is a network of highly specialized people and organizations that share innovative knowledge and experience in the search for new tools in the fight against disease. Chagas Global Coalition is the largest collaborative partnership of private organizations and in collaboration with public entities with the aim of promoting access to diagnosis and treatment. It was founded in 2012 by organizations such as DNDi, Mundo Sano Foundation, ISGlobal, CEADES Foundation, Baylor College, among others.